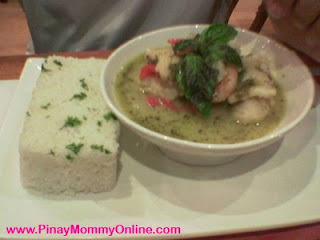 Last Thursday night, my hubby and I ate outside. Nothing to celebrate but I just wanted him to taste the food Bigby’s Café has. I have been hearing a good deal on the menus they have. So, I decided why not try some fine dining. Its not everyday we eat at a good place right? So when we arrived, my hubby started complaining about the price. The food looks delicious but the price seems so shocking for him. But still I justified it since I am the one who’s paying the tab. Hehehe… Anyway, we ordered two different meals and both are priced around $5 plus each. I ordered some pork chops and he ordered seafood in curry soup. It took more than 30 minutes for our food to arrive. But one thing that made it nicer to dine was the waiters. They were dressed up in Naturo Cartoon Characters in time for the Halloween. 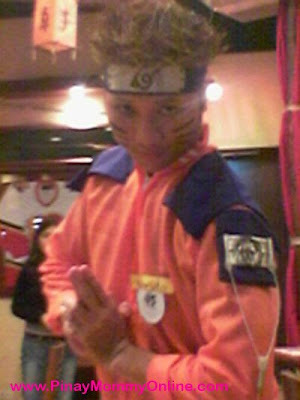 We were served by a waiter clothed as Naruto himself. When I asked for a picture, he immediately gave an action pose! Back to the food, it was indeed worth the pay. In the US, you pay around $5 for a Big Mac Meal but here you get enough to make tummies full with sumptuous food. My hubby did not even remember the price after we ate. It was so delicious that our bill that garnered around $13 including a bottomless iced tea and a cold kalamansi juice was enough to justify the words “fine dining.” Aside from the delicious food, the ambiance was great and so as the modern furniture they have. 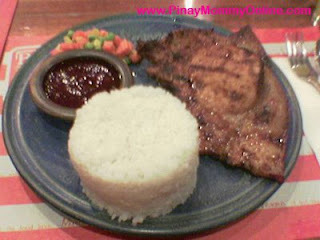 Anyway, Bigby’s Café is located in several major cities in the Philippines. Cagayan de Oro City has one too. Most of their branches are located in malls or in a city’s downtown area. So, if you’re looking for a good meal either pasta dishes or anything made with chicken, pork, seafood or beef, they may have something for you. They also serve burgers, gourmet cake and ice creams. Maybe I will try one next time! They offer FREE wifi access to customers too, so don’t forget to bring the laptop if you need to finish some work. Looks like the food is yummy anyway. Oks lang yung price. Musta ka na Mommy? 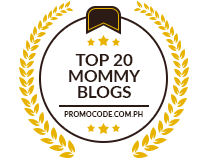 Kami eto kakabalik lang mag trick or treat…posted pics of our little one sa blog….